Our church lawn features a traditional-looking sign that displays the church’s name and web page. It’s nothing fancy, just an old-school variety with an open field on which messages have to be manually created, letter by letter. That’s part of the reason the message doesn’t change very often! Last fall, in anticipation of the Christmas season, we posted a simple message that’s often associated with Christmas: Peace On Earth. It hasn’t been changed since. Over the months I confess that I’ve grown a bit impatient with myself, every time I pass the sign feeling somewhat negligent about failing to create a new message. Recently, however, I’ve begun to feel comfortable about leaving it up—possibly indefinitely. 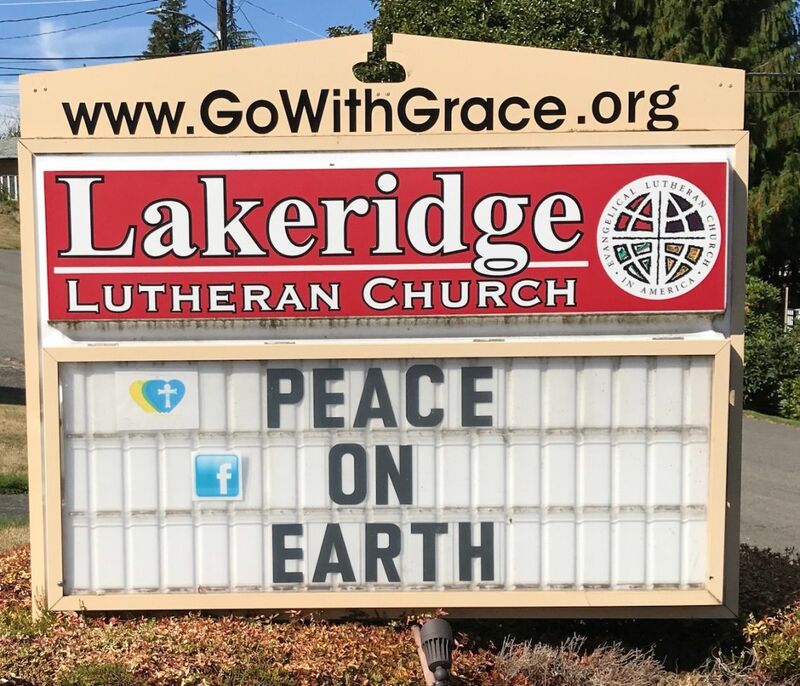 The days in which we live, including the most recent Las Vegas shooting tragedy, remind me that “Peace on Earth” is not so much a seasonal message as a timeless one. It is not so much a goal as a tangible reality that spiritual resources allow us to access, experience, and spread. To take each moment and live each moment with peace eternally. Over the decades we’ve learned to use more inclusive language for “Father” and “brother” but the message remains spot-on: Peace is not some sentimental, unattainable ideal. Nor is it a grand vision best left up to governments and “experts” to bring about. It begins, as the song insists, with me! Countless souls believe that peace “as the world gives” is the answer to our violent world. Our society seems convinced (depending on where you land politically) that more guns or more laws are needed. But neither more guns nor more laws can stem the fear and mutual suspicion infecting human hearts and minds. If anything “more” is needed in our time, it’s certainly not guns or laws. It’s more ordinary people like you and me who are convinced that everyday acts of love, kindness and compassion really do have power to save the world. Today, and every day, how does God’s peace—a “peace that passes understanding”—begin with you?